11.4.2019 – Two lions just rescued from the Gaza Strip by international animal welfare organisation FOUR PAWS have safely arrived in South Africa on 10th April. In its biggest emergency mission to date, FOUR PAWS rescued a total of 47 animals from a neglected zoo in Rafah, Gaza on 7th April. Most of the animals were brought to Jordanian wildlife sanctuaries. However, FOUR PAWS transferred lion Motan and lioness Pisa to its South African big cat sanctuary LIONSROCK, a species-appropriate home where they will receive the special care they urgently need. 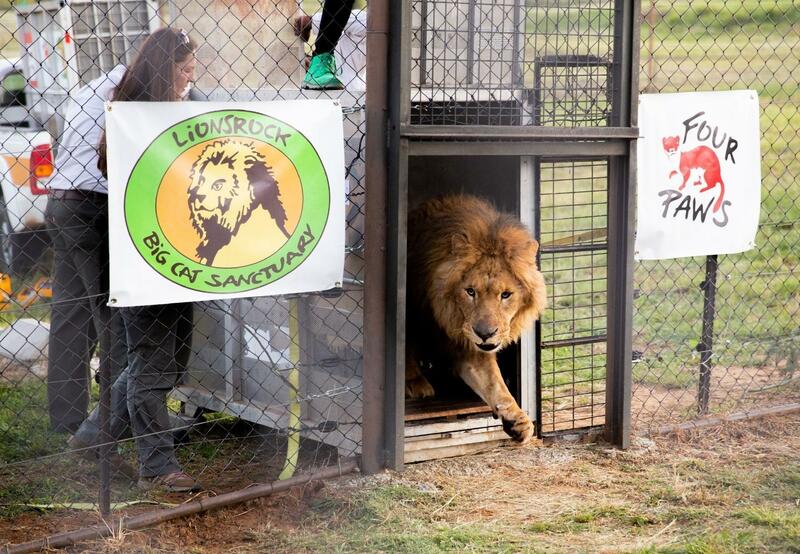 The two lions, named Motan and Pisa by FOUR PAWS, landed at OR Tambo airport in Johannesburg on 10th April after which they were transported to LIONSROCK. “The lions arrived in a relatively good condition. We will release them in a special care unit. This is important during their adaption phase to ensure they get used to their new surroundings and caretakers. Both will be closely monitored, and we will evaluate their well-being throughout,” says Hildegard Pirker, head of the animal welfare department of LIONSROCK – a FOUR PAWS sanctuary that houses over 100 big cats rescued from zoos, circuses, war-torn areas and the canned hunting industry. In previous years, FOUR PAWS has been successful in saving animals from Iraq, Syria and Gaza – with most of them have come to LIONSROCK. Motan and Pisa will join the likes of Simba and Saeed, two lions rescued from zoos in Mosul and outside Aleppo in 2017, as well as tiger Laziz rescued from a zoo in Gaza in 2016.
says FOUR PAWS veterinarian Amir Khalil, who heads the missions in conflict and war zones. After months of preparations and several attempts, FOUR PAWS’ most recent and biggest emergency rescue mission took them to Gaza on 4th April. Within four days, the team, consisting of veterinarians and wildlife experts, were ready to start the almost 300-kilometre journey with 47 rescued animals to Jordan early in the morning on 7th April. In the late evening, FOUR PAWS arrived with the animals at the wildlife sanctuaries, about one hour away from Amman. There, the majority of the animals were released into their new, species-appropriate enclosures. Among them was a declawed lioness, whose brutal mutilation caused public outrage around the globe at the beginning of the year. She and her two siblings found a new home at the wildlife rescue centre “Al Ma'wa for Nature and Wildlife” – a joint project of the Princess Alia Foundation and FOUR PAWS. Only the two older lions Motan and Pisa continued their journey to South Africa via plane.